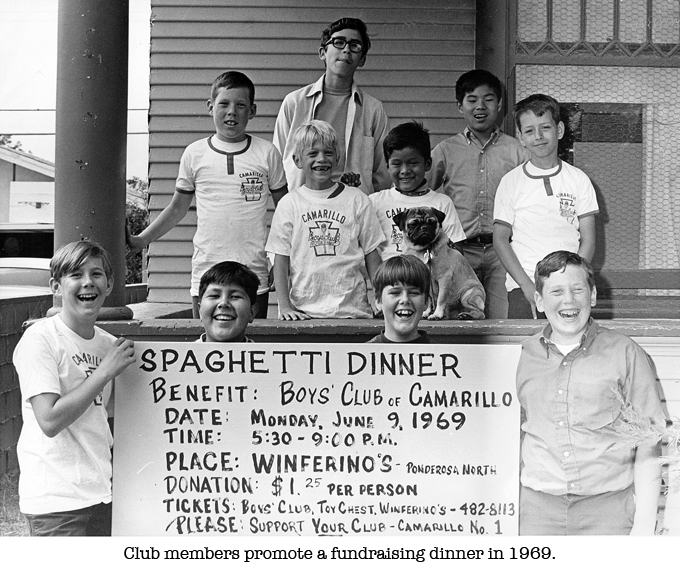 Gerry Calhoun met Boys Clubs of America’s Martin Gottlieb in 1966, and that meeting launched an idea that has helped transform the lives of thousands of Camarillo kids. Gottlieb wanted to start a Boys Club in our new city, which had incorporated just two years earlier. He thought that Calhoun, then president of the Camarillo Optimist Club, might be the right person to help, and he offered the Optimists $3,000 in seed money. The Optimists soon joined forces with the Pleasant Valley Lions Club, and the two organizations met regularly to discuss founding a Boys Club. The Camarillo Daily News also got behind the idea, and a board was formed, with Calhoun later being named the club’s first president. 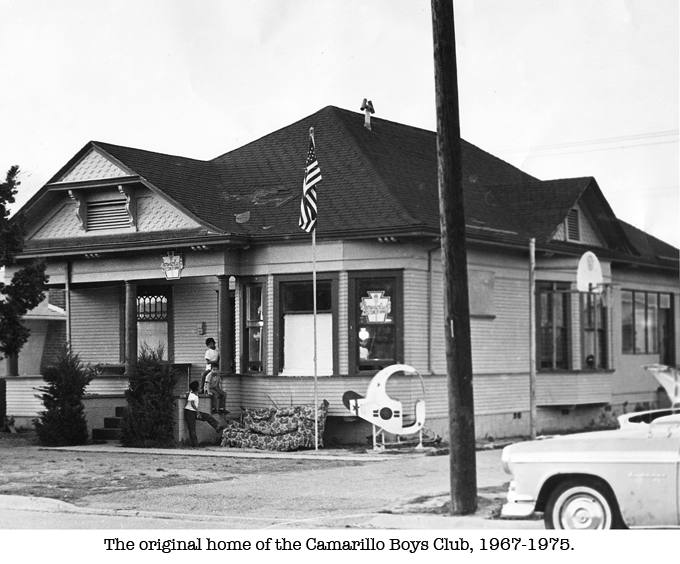 Lions Club member Stanley Rank found the Camarillo Boys Club’s first home—a small house at 2825 Barry Street. It was not in the best of condition, but at least it gave kids a place to go. Soon club directors began writing grant proposals for operating capital, and started searching for an executive director. 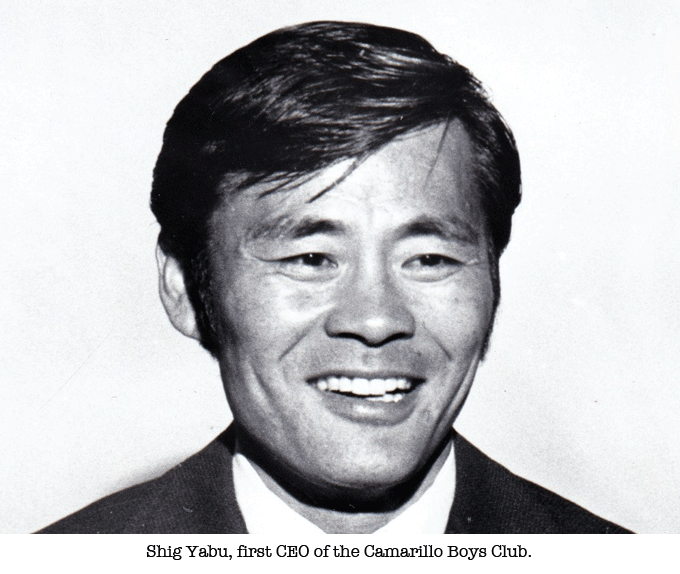 Shig Yabu, who had previously worked at the Boys Club in Linda Vista, California, was hired as our first leader. Shig was instrumental in the growth and success of the Club during its early years. The first years of the Club were filled with hard work, small donations and frequent spaghetti dinners, candy sales and other small fundraisers. Some people donated crops (a field of watermelons, for example, or a grove of oranges). 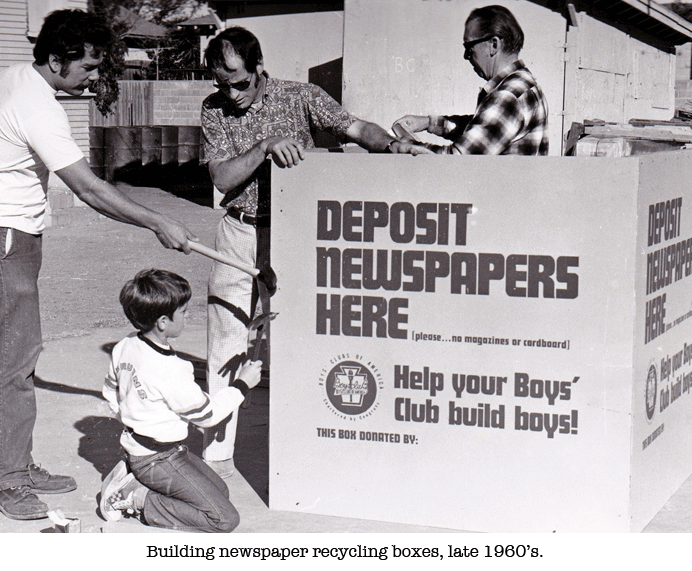 We recycled newspapers, glass and metals before recycling became popular. Every dollar helped. Club transportation was an old Ford Falcon, and when it finally broke down, with no money for repairs, a wonderful gentleman named Spencer Honig came to our rescue. Spencer was an automobile distributor, and he inaugurated an annual Gourmet Dinner event that not only brought us a new van, but also provided funds for many other projects in succeeding years. Despite early challenges, the Club continued to grow, and desperately needed a new location and building to replace the aging house on Barry Street. 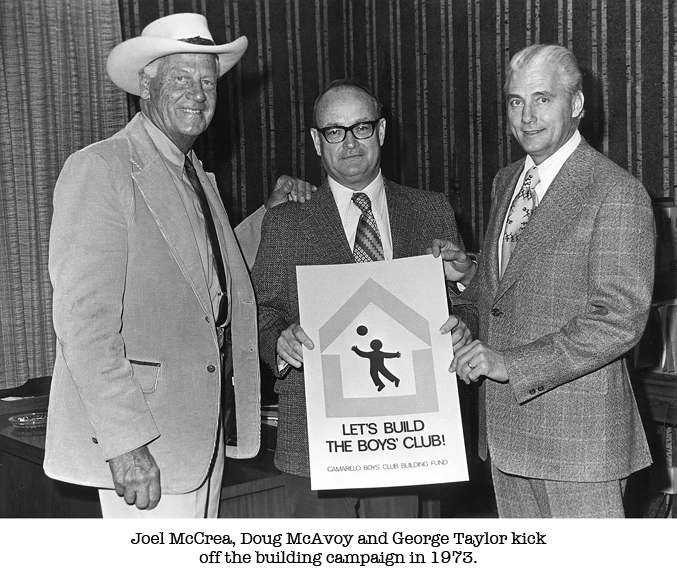 In 1973, directors announced a new capital campaign, led by noted actor and local resident Joel McCrea. 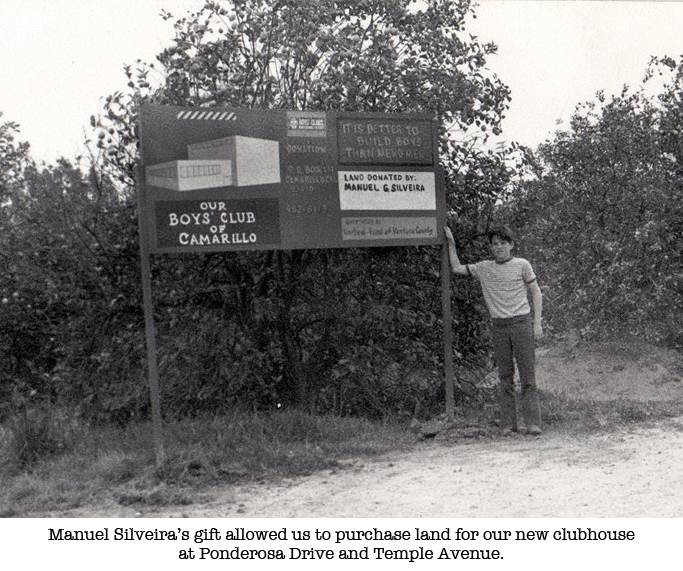 In addition to McCrea’s major campaign gift, another large donation came from the sale of a parcel of land previously donated by longtime Camarillo resident Manuel Silveira. 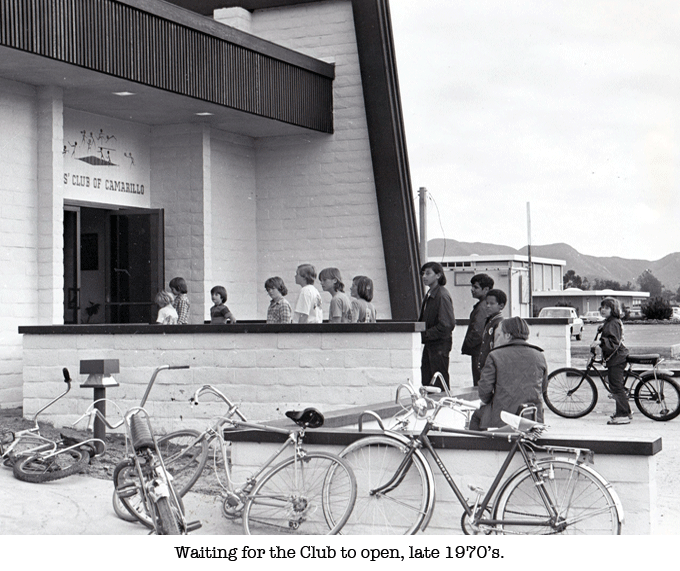 Just two years later, in 1975, the first phase of the new Club opened its doors at Ponderosa Drive and Temple Avenue. 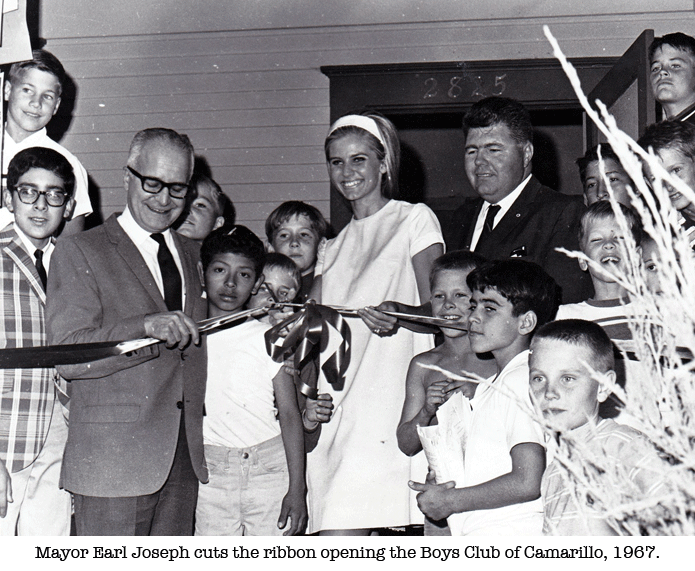 Meanwhile, more girls began using the Club and participating in its programs and activities, and in 1981, our name was officially changed to the Boys & Girls Club of Camarillo. 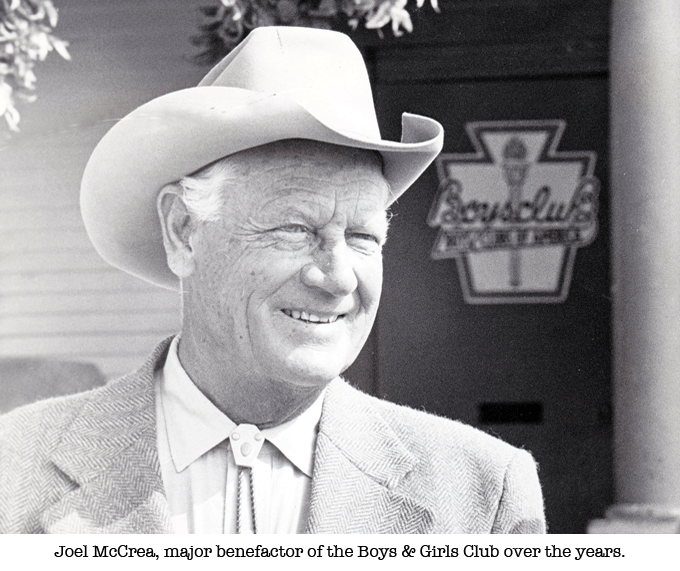 In 1982, we began the campaign to build the second phase of the Club, and once again, Joel McCrea stepped forward, this time donating five acres of land he owned in Santa Rosa Valley. The sale of that land provided more than $250,000 for the campaign. Groundbreaking took place on June 1, 1982, and construction was completed a year later. The major feature on the expansion—a new gymnasium—was named in McCrea’s honor. 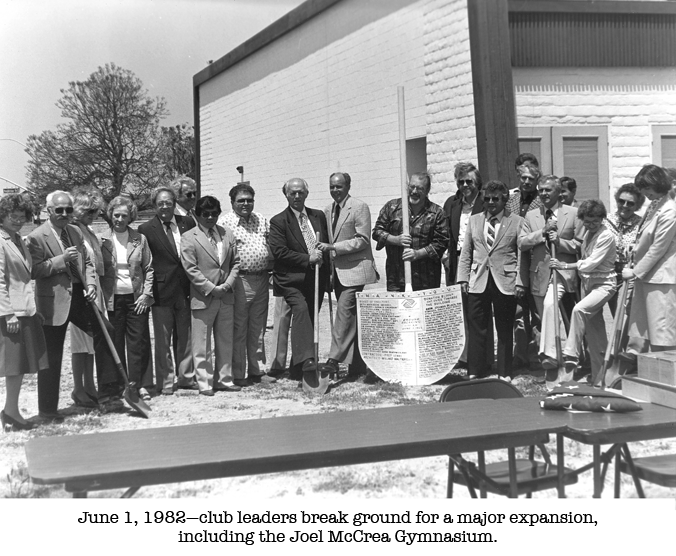 With the Club’s expansion, membership also grew dramatically, and by 1993, plans were under way for the third phase of our building. After a successful capital campaign, we were able to enlarge our learning center and turn previously unused storage areas into multipurpose meeting rooms, a new stage, a new kitchen and snack bar, an expanded parking area and many other improvements. Today, as we continue to grow, we have begun the fourth phase of our facilities, a 6,500-square-foot addition that will give us needed space to provide even more programs and opportunities that will benefit kids for years to come. For more details, click here.